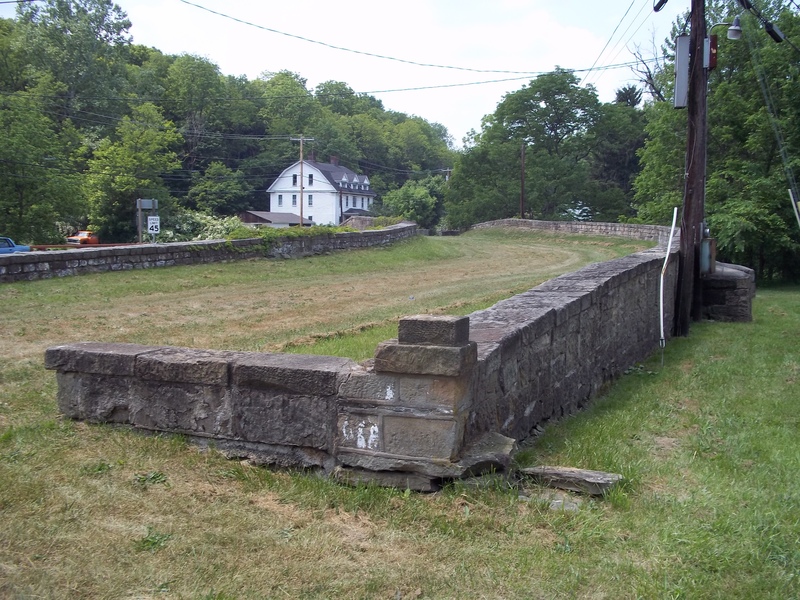 Mile 106 – S Bridge, Buffalo Twp., Washington County, Pa. The S Bridge, Washington County, Pa.
An unusual form of bridge architecture exists along the National Road in Pennsylvania and Ohio – the ‘S’ bridge. These bridges are exactly what the name infers – they are shaped like an ‘S,’ apparently in an effort to save on materials. 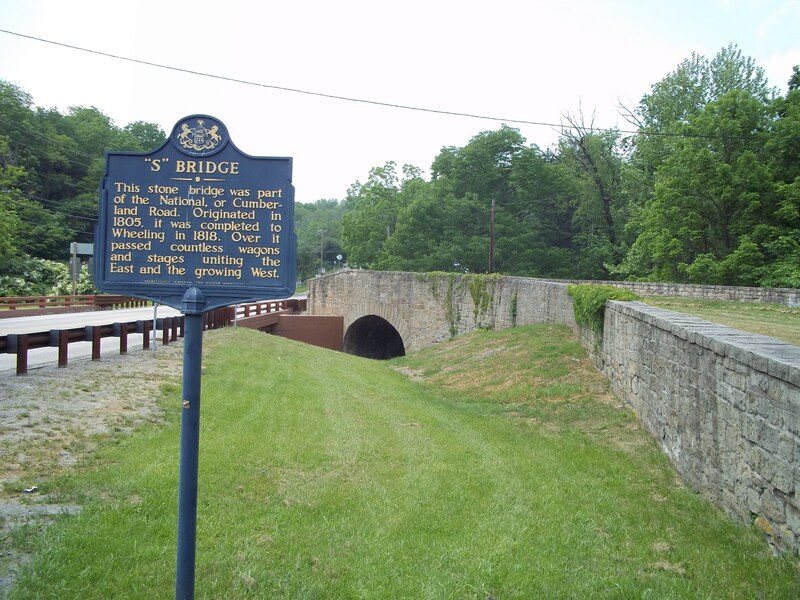 The S Bridge in Pennsylvania is the only one of its kind in the state, and spans a small creek in western Washington County, just east of Claysville. The structure was built around 1818, and was eventually bypassed by newer infrastructure (like the fate of the Casselman River bridge in Maryland). In the case of ‘S’ bridges, as cars began to replace horses, and as those cars became faster, the curvature of those bridges posed a safety hazard as well. The historical marker nest to Pennsylvania’s ‘S’ bridge. Today, the bridge, its deck covered in grass, is still open to the public as a pedestrian path and is on the National Register of Historic Places. There is a parking lot north of the bridge on Pa.-221, and its a short walk to the bridge from the lot. The current U.S. 40 passes right beside the bridge, adjacent with its intersection with Pa.-221. While Pennsylvania only has one such bridge, there are several remaining ‘S’ bridges in eastern Ohio. Jim Grey, who has been a frequent resource for this blog, has chronicled those structures. So until I get to Ohio (and even after), check out his blog. 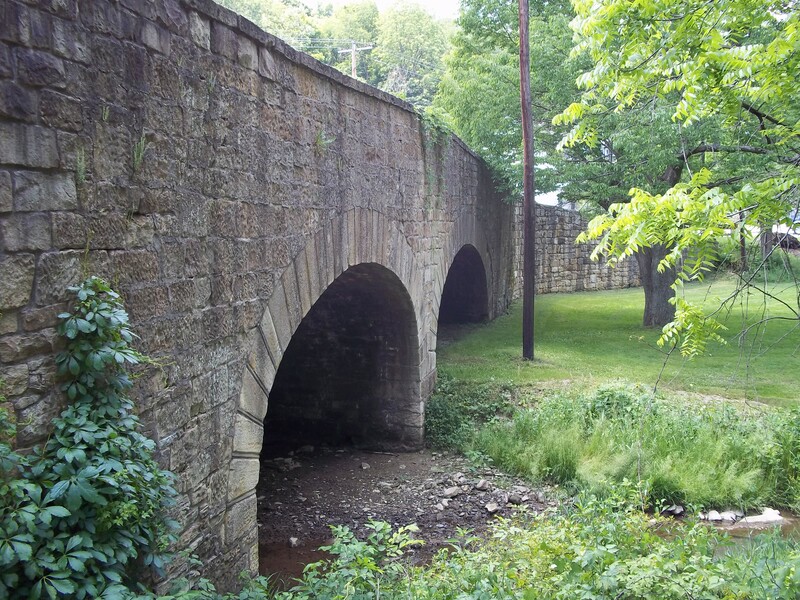 Pennsylvania’s ‘S’ bridge spans a small creek in rural Washington County. 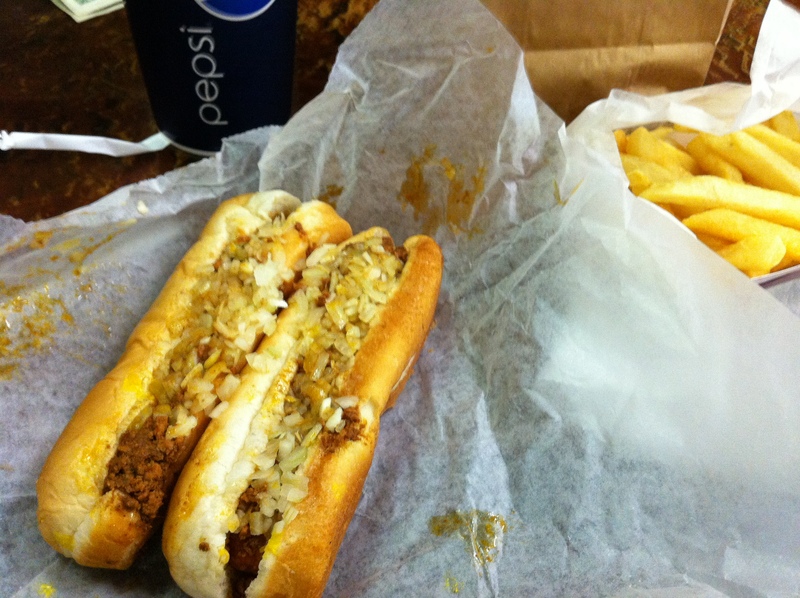 Mile 100 – Shorty’s Lunch, Washington, Pa. 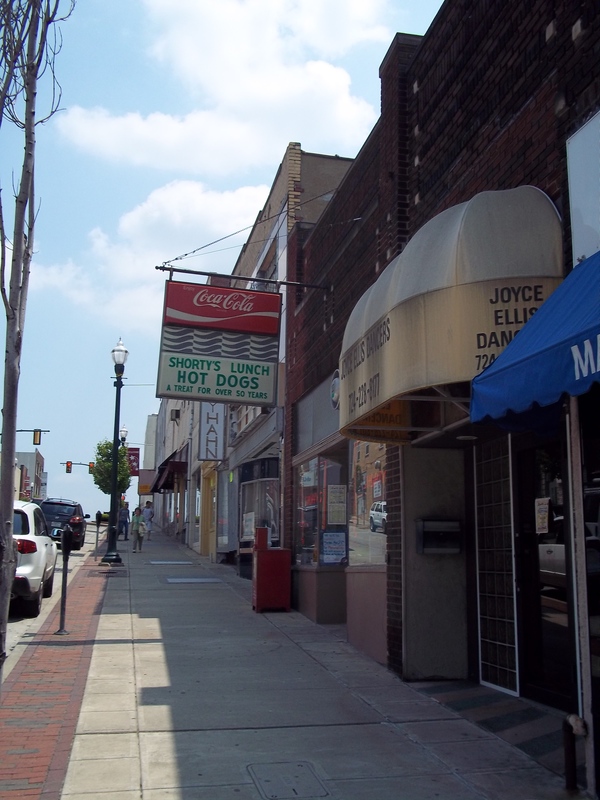 It seems like almost every old city has at least one hot dog/hamburger/lunch place that has survived downtown for decades, despite the general decline of downtown areas in the U.S.
Washington has Shorty’s Lunch, tucked along West Chestnut Street downtown. Shorty’s has been around since 1932, and the eight booths inside haven’t changed. Like Coney Island in Cumberland, there is a bar/counter along one side of the dining area, and the booths line the opposite wall, making Shorty’s a pretty packed place with just a relatively small crowd. The menu is pretty simple, with hot dogs and hamburgers being the staple. The grill sits in one of the front windows, so anyone walking along West Chestnut can see the rows of hot dogs being cooked inside. A hot dog with everything (which is what I inadvertently got) has a mustard base, and is then layers with a type of chili sauce and onions. I actually had no idea of the reputation Shorty’s has in southwest Pennsylvania. When I was in Washington, I just picked Shorty’s because it was one of the only older-looking restaurants downtown – and hot dogs always sound good. But as I started to look for background information online, I saw that Shorty’s had been featured in a number of publications including the Pittsburgh media (Shorty’s has its own Wikipedia article, which links to most of that information). It’s not surprising that Shorty’s has a dedicated customer base – not only is the food good, but people seem to be generally protective of their old hot dog establishments (For me, I’m always going to be biased toward Coney Island in Cumberland, and will defend that it has the best hot dogs of anywhere – despite that there are just as many equally-great similar places). Shorty’s is open Monday through Saturday, from 10 a.m to 4 p.m. Parking is available along just about every street in downtown Washington. Because the menu is so simple, you’ll probably have whatever you order in less than a minute. Take-out also seemed to be a popular option at Shorty’s. 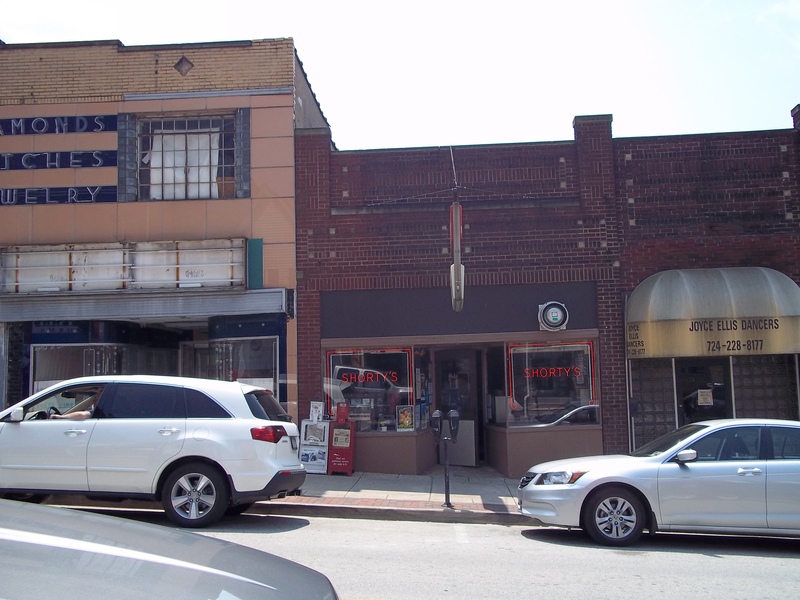 It is located at 34 W. Chestnut St., between Main Street and Jefferson Avenue. Mile 83 – Madonna of the Trail, Beallsville, Pa. The Madonna of the Trail in Pennsylvania, Beallsville. 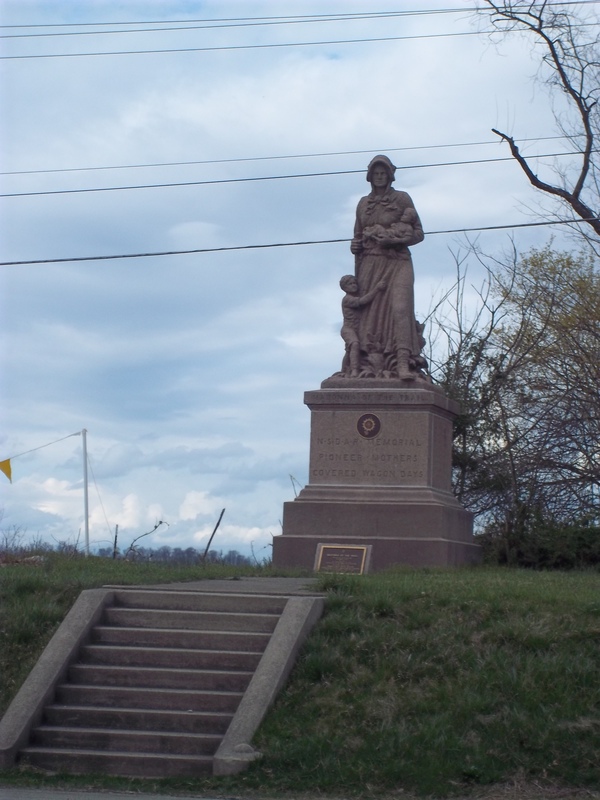 Located between the borough of Beallsville and the small community of Richeyville is the Pennsylvania edition of the Madonna of the Trail, one of 12 such monuments along U.S. 40 and U.S. 66 in each state through which those routes pass. These monuments were planned by the Daughters of the American Revolution in the early 1900s, and were meant to mark the National Old Trails Road, which included the National Road on its journey west, as well as commemorate female pioneers who settled the American west. Each statue is identical and was designed by August Leimbach. The Pennsylvania Madonna was put in place on Dec. 8, 1928 – the tenth of 12. Every monument is along the original National Road or Santa Fe Trail, with the exception of Maryland’s, which is in Bethesda, a suburb of Washington, D.C. In order from east to west, Madonna of the Trail monuments are located in Bethesda, Md. ; Beallsville, Pa.; Wheeling, W.Va.; Springfield, Ohio; Richmond, Ind. ; Vandalia, Ill.; Lexington, Mo. ; Council Grove, Kan.; Lamar, Colo.; Albuquerque, N.M.; Springerville, Ariz.; and Upland, Calif.
Pennsylvania’s monument was rededicated in 1978, and was restored and rededicated again in 1990. The DAR’s Washington County chapter is responsible for the maintenance of the statue. The Madonna of the Trail is located right between the central areas of Beallsville and Richeyville, directly across U.S. 40 from the main entrance of the Nemacolin Country Club. Like all of the Madonna monuments, it is free and open to the public. A small pull-out exists on the north side of the National Road (the same side as the monument). 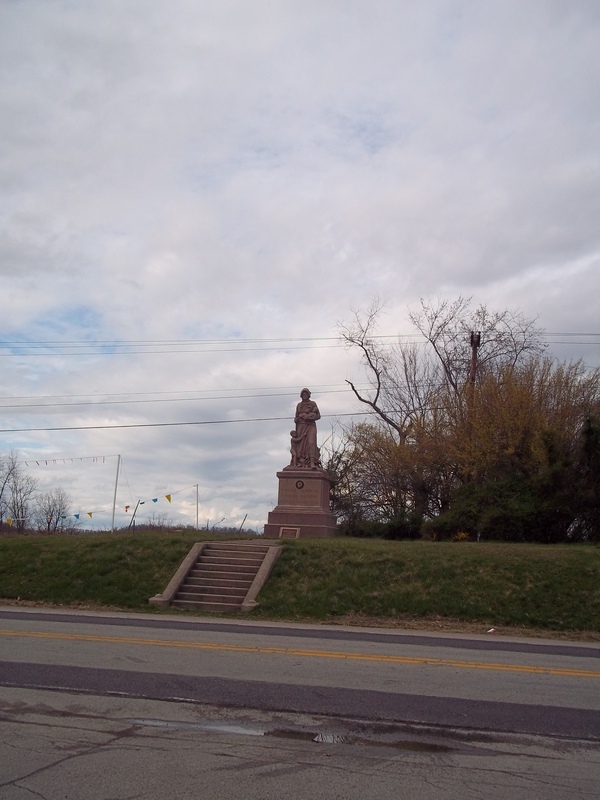 It’s important to use common sense when visiting the monument, as it is right up against U.S. 40, and drivers aren’t always aware of pedestrians along the highway. Also, check out these other posts on Madonnas around the country from Jim Grey, Sculpted Portrait and Frank Brusca. The Madonna as seen from across the National Road at the entrance to the Nemacolin Country Club.